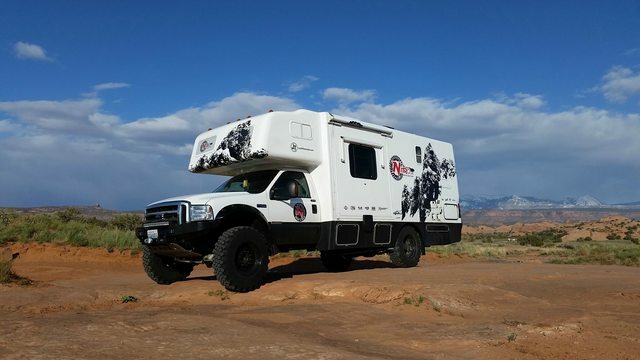 I originally posted this build in the full size forum, but since it is a expedition camper I figured we could show it off here too! I hope you guys enjoy it. Here is our current spec list for the rig, you can see the stages we went through to get the rig to this point below. 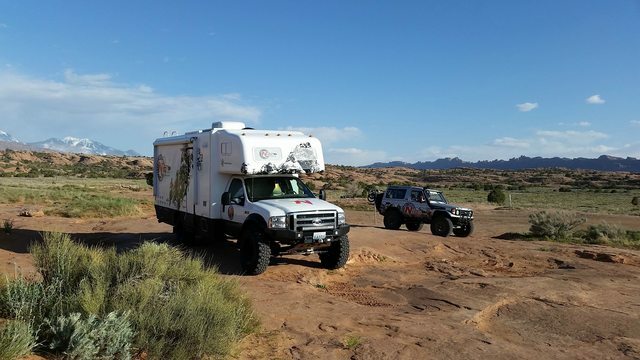 We were in need of a tow / stay vehicle for traveling to national off road events. Travel in snow is also a bit of a concern. 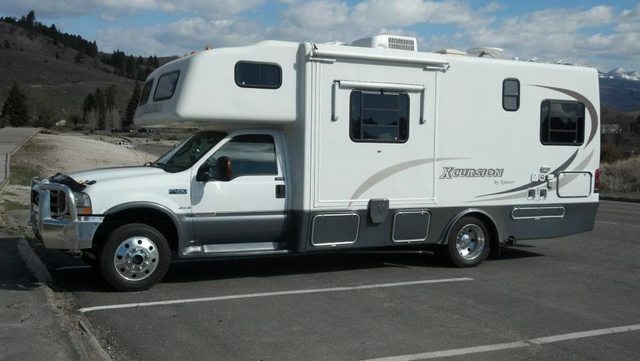 We needed something that could sleep 2-4 comfortable, and still tow 10k lbs. 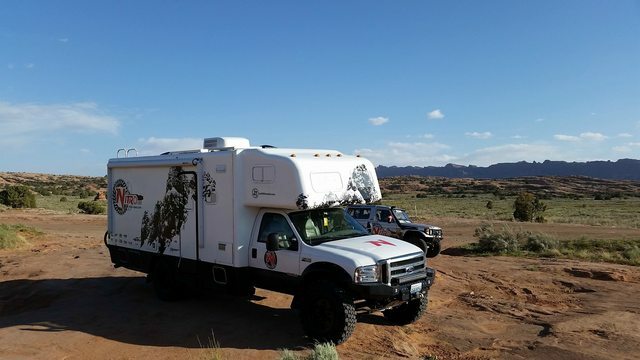 Options considered a Diesel Pusher (too big, 2wd), Truck with camper (too small), Class C (Van type too light duty, 2wd, gasser engine would not suffice), then we found the solution. Also we wanted a vehicle that would showcase the products that we offer. 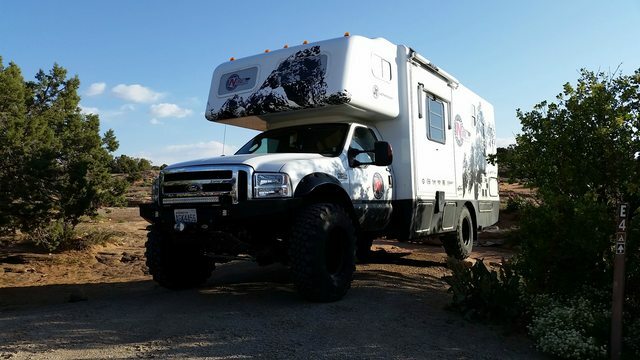 The F450 4x4 chassis fit the bill. Although it was 4wd, it didn't really look the part. 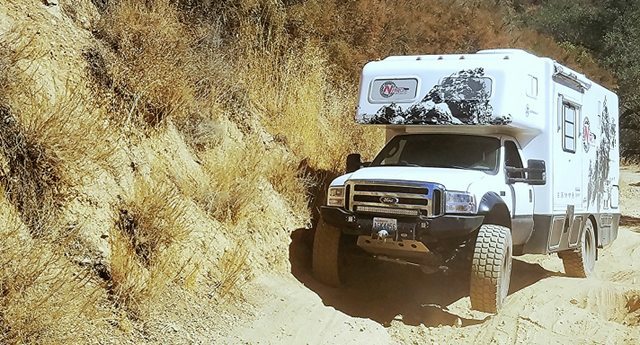 the home portion of the RV keeps the rear wheels really tucked, and the factory 225/70r19.5 tires are only about 31", which look to small for our liking. Functionally we wanted the additional ground clearance of larger tires. Also a SRW conversion seemed ideal for winter traction and to avoid wedged rocks on the duals when off road. 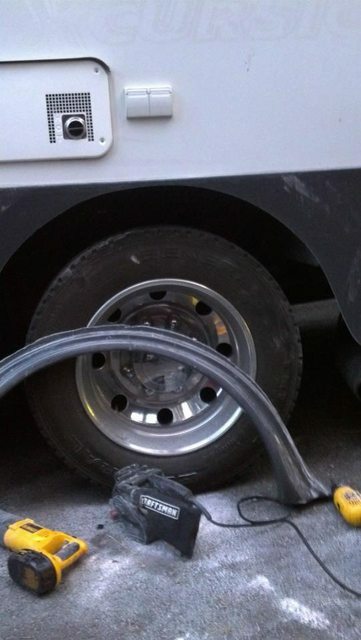 To go single, we needed a tire with a high capacity. The loaded wet weight is about 14k (5k front 9k rear). The factory duals were rated at 3350 ea (13,400 lbs total rear axle). 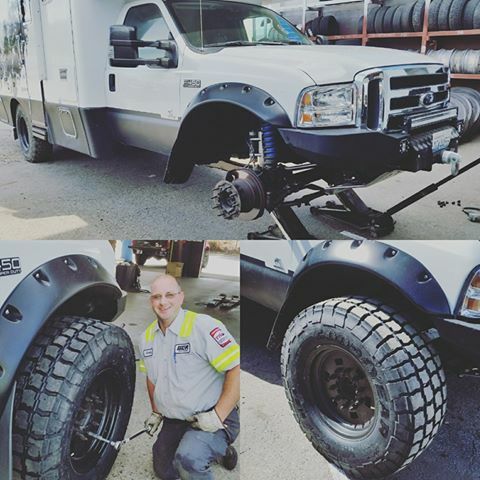 We contacted Rickson Wheels for some custom 22.5" bolt on steel wheels to run big rig tires. They actually had a full set ready to go that were take-offs from the Turtle V Expedition vehicle. This seemed like an obvious choice, but what about tires? Most of the 22.5 semi truck tires have a highway type tread. We wanted something aggressive. We ended up finding some Double Coin RLB800 11R22.5 tires. These have an aggressive tread, and rated at 6940 lb each. Sounds great, but they measure 42" tall. That's a big step from the factory 31" tires. To clear the tires the truck was definately in need of some suspension. We wanted to keep it as low of COG as possible so didnt want a big lift. 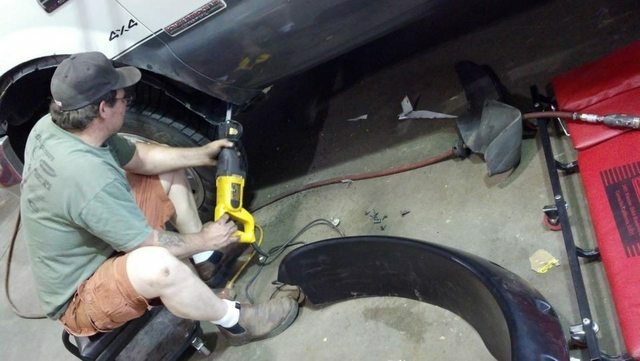 After consulting Bushwacker, we found their Cut-out fender flares would clear bout a 40" tire with a leveling kit on a Superduty. 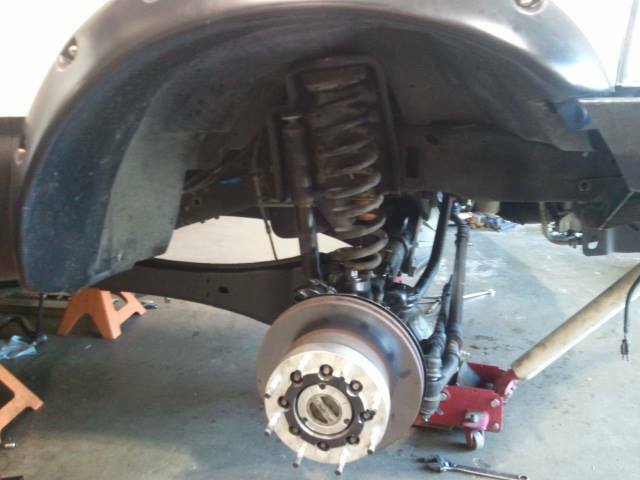 With the help of Ben at National Springs, we found are OE rear packs were only rated for 8750 lb, already too soft. 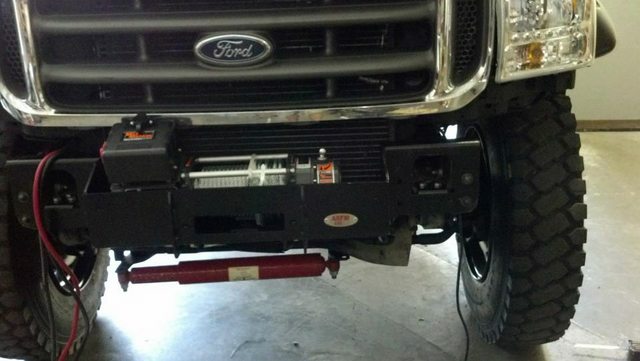 We chose some 12,000 pound pair, and added a custom 1" full size block bolted into the leaf pack. The front we used std Leaveling mini pack. This yielded about 2.5" lift. 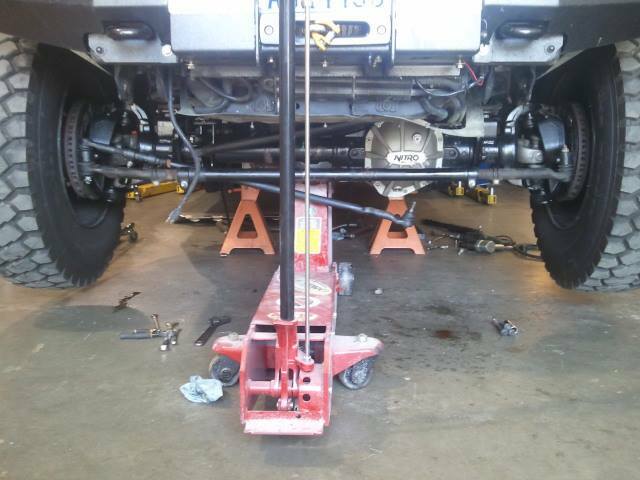 To minimize body roll we also installed Hellwig 1.5" swaybars and extended front links. 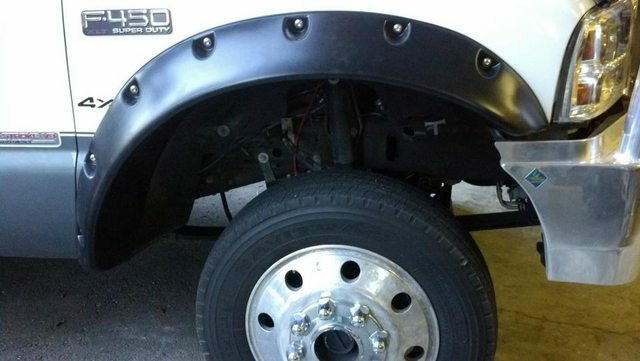 Since the rear is fiberglass, we removed the OEM flares and trimmed out about 5" around the arch. Since the singles are narrower we decided to run without flares on the rear. 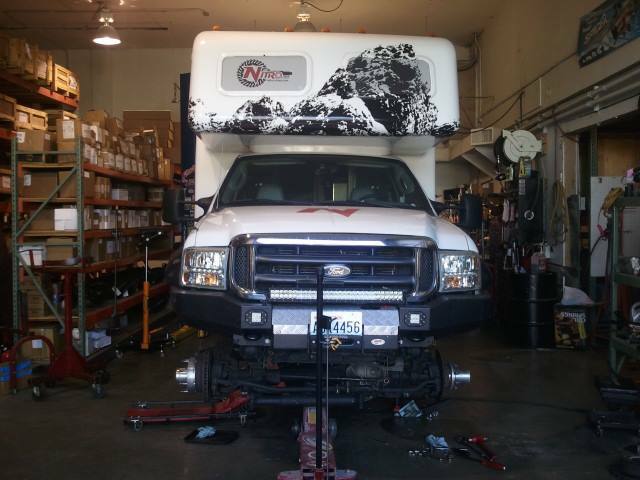 Aaron & Robert at our local Les Schwab truck center, jumped at the opportunity to try cramming 42" Big Rig Traction tires on a motorhome. Keeping it local helped out here as they offered to test fit them. To their surprise the tires fit great! The Herd Alloy bumper looked nice before, but was going to require significant modifications to match the new fenderline and would not hold a winch. 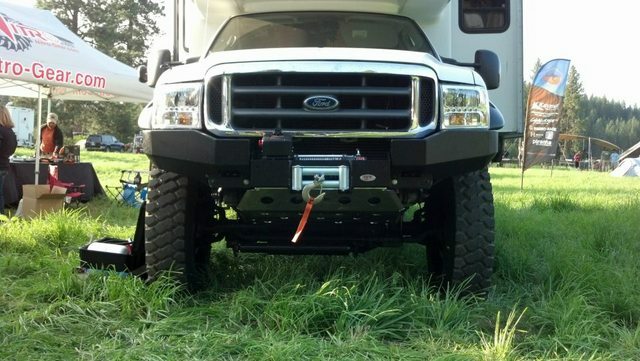 We contacted ASFIR 4x4 for their new modular front winch bumper, these are great as they can be shipped UPS due to the 3 piece construction. 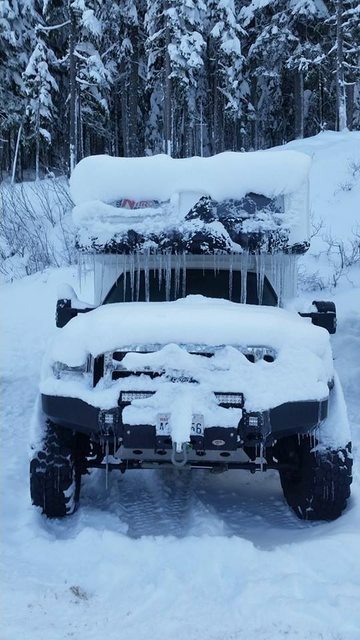 It housed the new Milemarker 15k lb winch nicely! The timing was good, as we just started stocking a full line of ratios and traction devices for medium duty trucks. 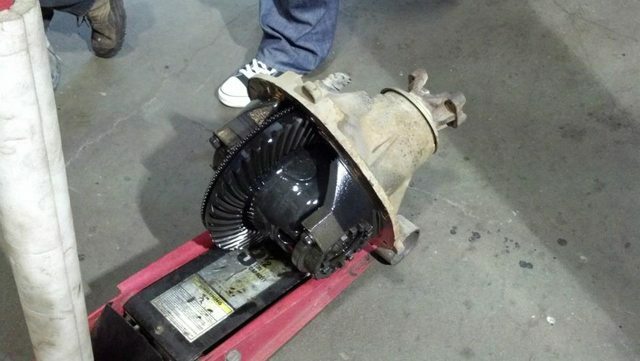 This means we have gears in stock for this S110 as well as S130 & S135. The Factory Dana Corporation 4.30 gears were fine with 31's but needed more for 42". 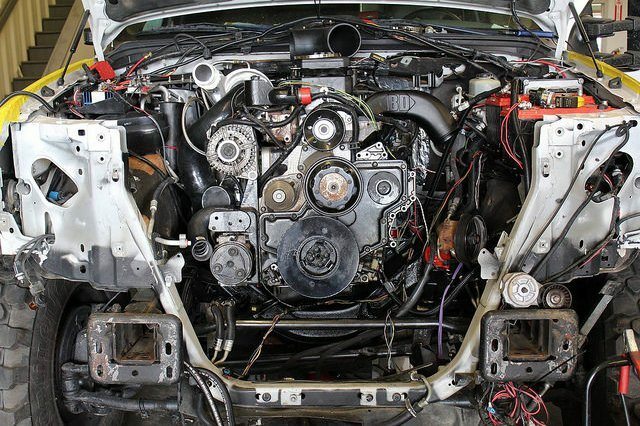 We chose 5.38 gears, and a Eaton Corporation Truetrac LSD. This gives us near stock gearing. Actually just a few RPM's lower on the highway than stock. 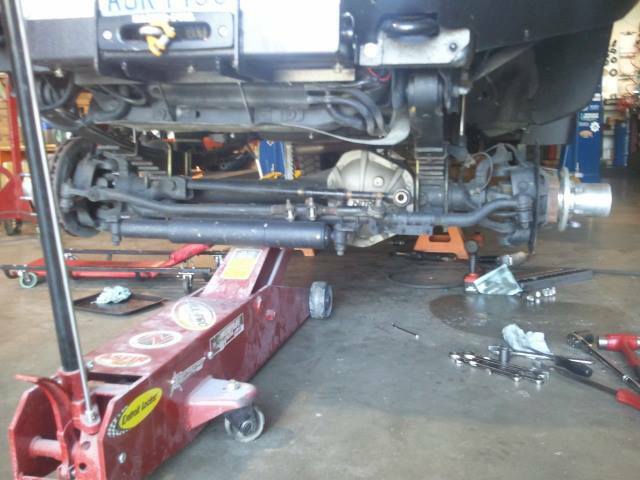 We used our part number DS110-538-OE ring & pinion, MK DS110 install kit, TT 504038 Truetrac LSD and DAN130647 ABS tone Ring. This Monster weighed 173 lbs! 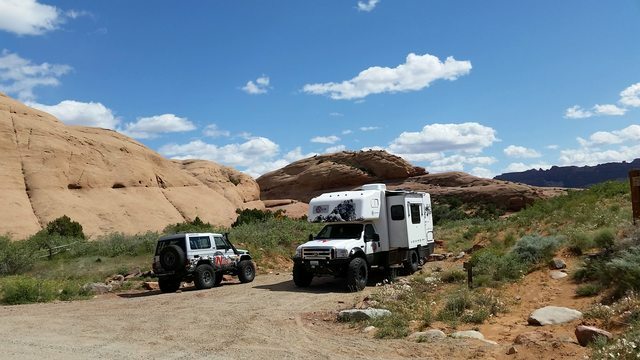 Our new Goodyear tires showed up and we got them installed just in time for Overland Rally! 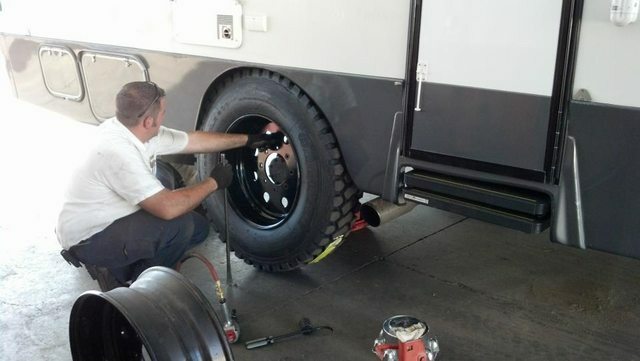 So far we have noticed these tires are much quieter than what we had on here before. We look forward to putting lots of miles on them over the next few years. 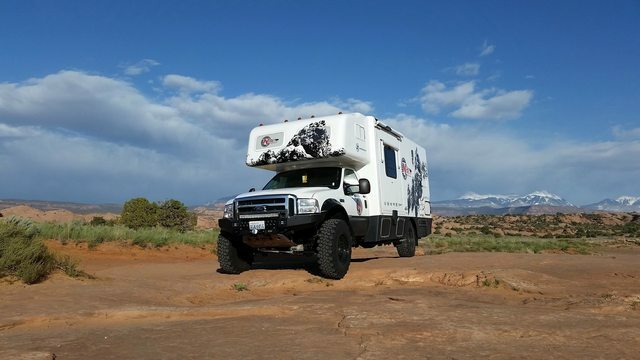 Come stop by our booth and check out the F450 Motorhome this weekend. They spin very smoothly and are much quieter, we can hardly hear them over the wind noise in the RV. These tires run a big larger than the same sized continentals and are about 2 inches wider. Somewhere along the way of this build, some of the stuff that we have done hasn't been updated. 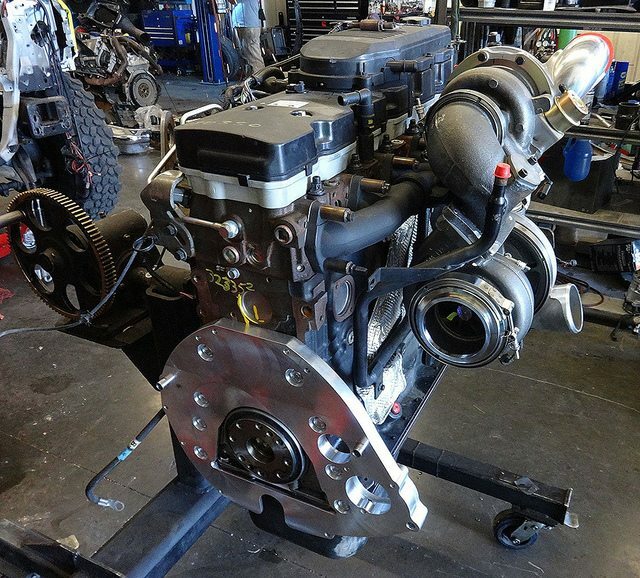 Last year we decided that the 6.0L Ford diesel wasn't what we wanted, no matter how we built it. 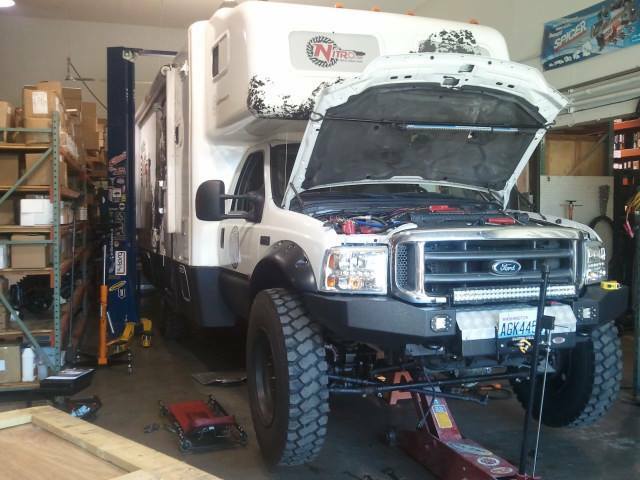 After some research we decided to bring the camper to Diesel Conversion Specialists in Kalispell Montana so they could install a 6.7L Cummins. 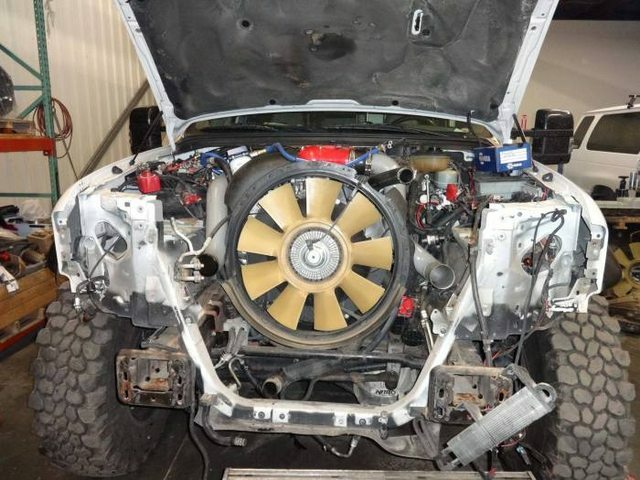 With the help of a ATS built 5R110 Torq-Shift Auto Trans (with a high capacity ATS aluminum trans pan) and a Five Star Torque Converter (built for the Cummins/5R110 swap) the crew at Diesel Conversion Specialists were able to shoehorn in a twin turbo 6.7L. Our Ford has become a Fummins! That rig is impressive, especially in person! 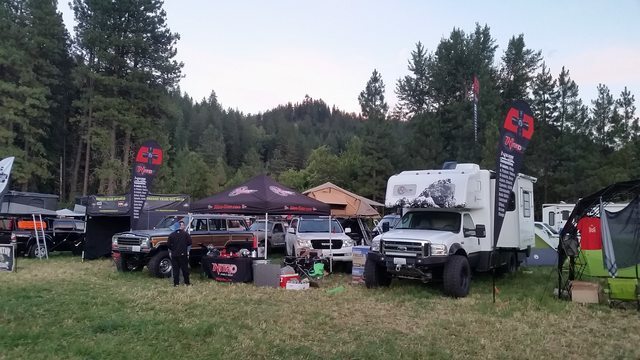 I attended the NWOR this year where I met Carl and his crew. Great company, how can you argue when they provide hard to find quality parts, great advise and free beer!!! Thank you for the kind words, David. 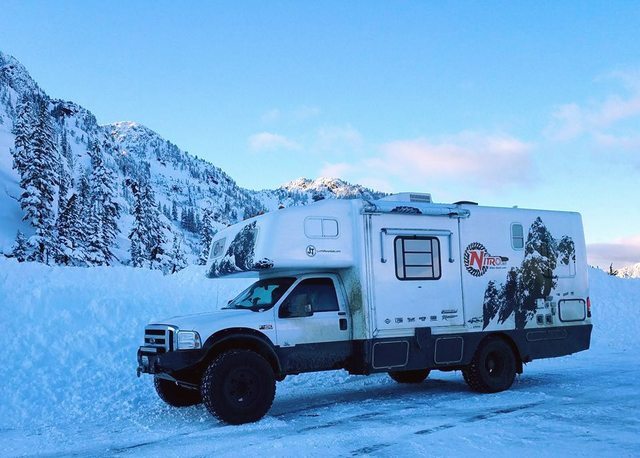 The camper gets plenty of use year round. 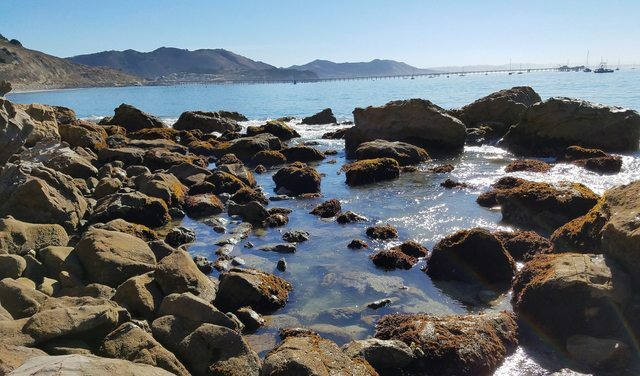 It works great for ski and snowboard trips during the winter! 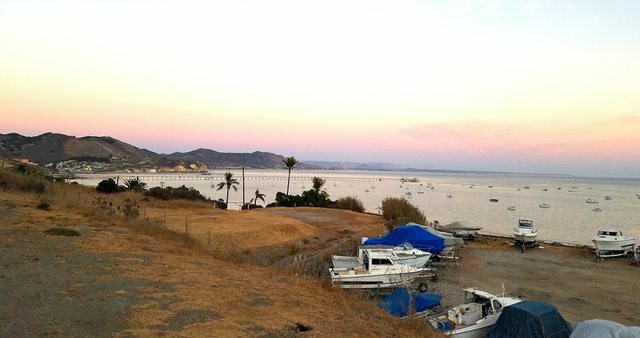 Check out our latest blog entry with tons of pics and info about the RV. 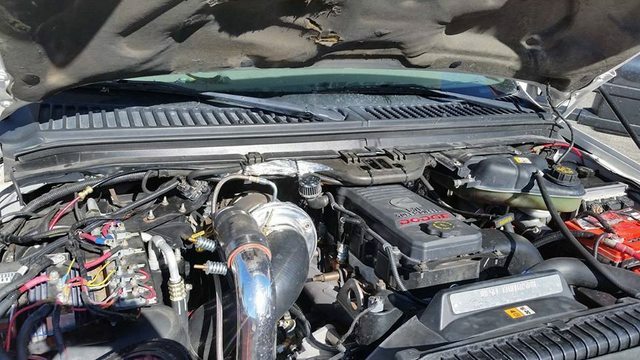 Here are a few more pics of the Cummins 6.7L Twin Turbo conversion and the ATS Built 5R110 Torq-Shift Auto Trans done by Diesel Conversion Specialists in Kalispell, MT. I remember watching the original build on PBB. Cool to see it updated here. Thank you, we really enjoy it and it gets tons of use! 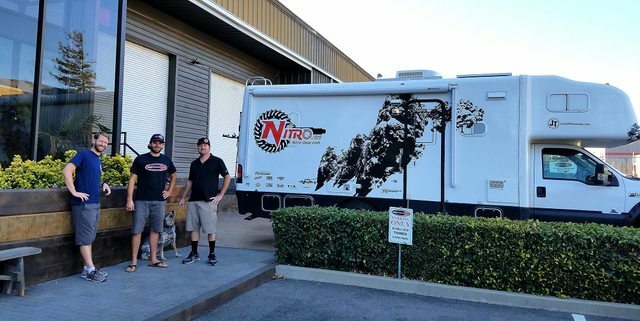 If you live on the Central California coast you might have spotted the Nitro Expedition RV making some rounds as Carl was in the area to visit some Nitro Gear and Axle dealers and see some family. 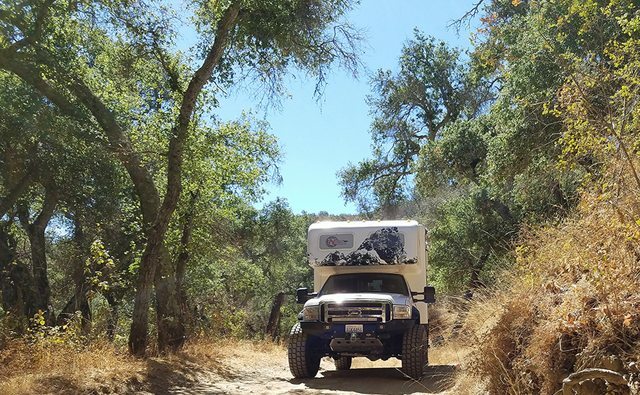 The rig also got some dirt under the wheels (and some air) doing some trail riding on the way to a remote outdoor punk rock concert in the hills outside of San Luis Obispo. 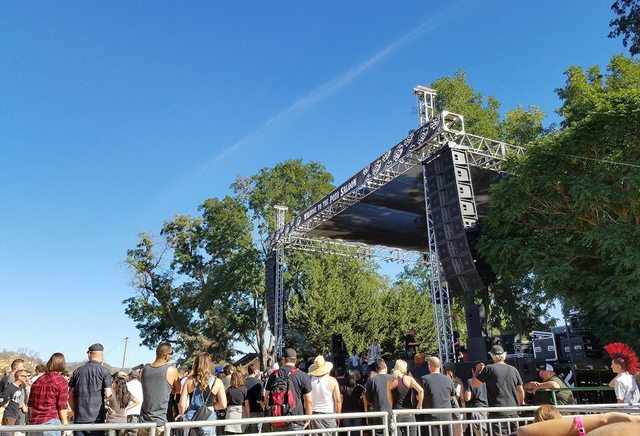 As luck would have it Nitro dealer and owner of Poly Performance, Dave Schlossberg, was headed to the Pozo Picnic also and suggested an alternate route to the event on High Mountain Road. 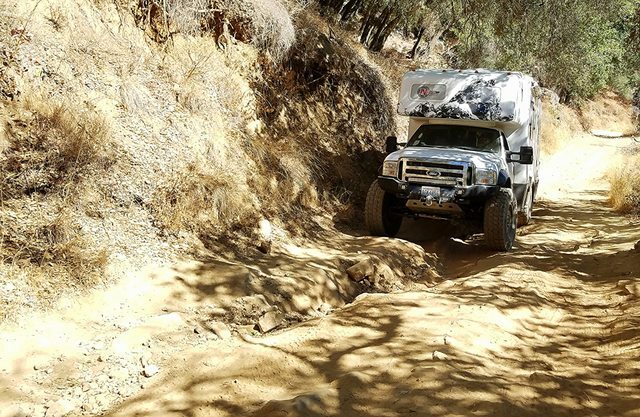 This dirt track/4×4 trail would end at the Pozo Saloon and make for a perfect way to take the road less traveled. Rolling out about 11am the mountain road started out as a typical mild dirt road, but with some very tight spots when you are in a 17,000lbs RV on 41″ military tires. Overhead clearance was an issue as the trees in the area weren’t really trimmed enough for the extended height. A few branches came down, but no damage was done to the big 4WD Ford. 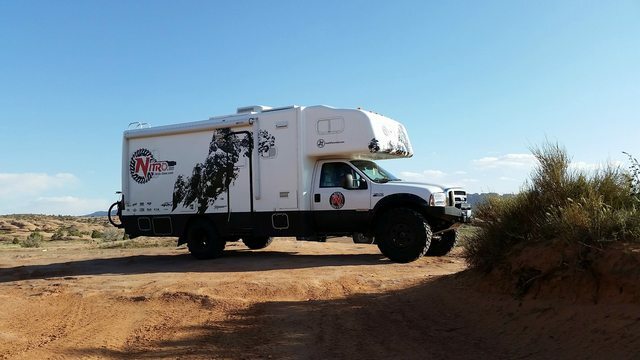 Nitro Gear 4x4 F450 Cummins Powered RV / Motorhome on 41" military tires. Now for sale $125k Please email carl@justdifferentials.com for more info. 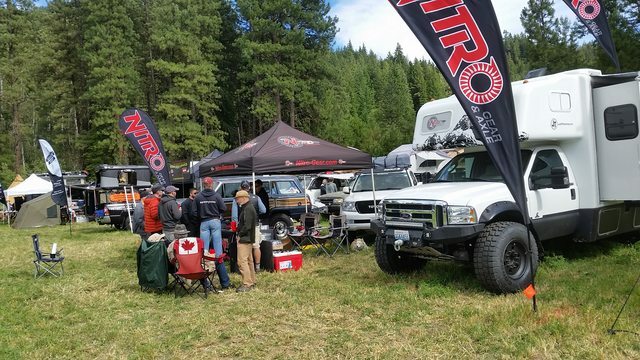 If you’ve read any of our earlier blog posts it’s probably become quite clear that we at Nitro Gear and Axle are serious gearheads. 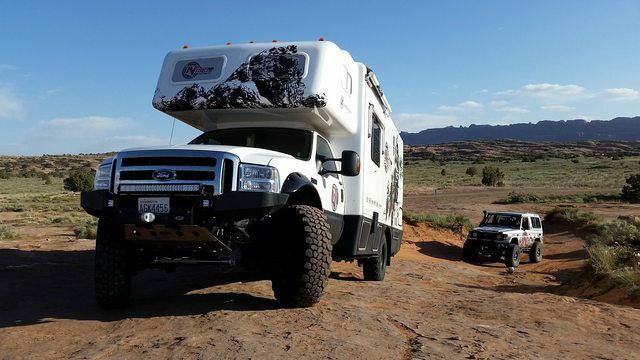 To say we’re obsessed with 4×4’s, sports cars, and even RV’s would not be an understatement. We simply love machines and we love modifying them even more. 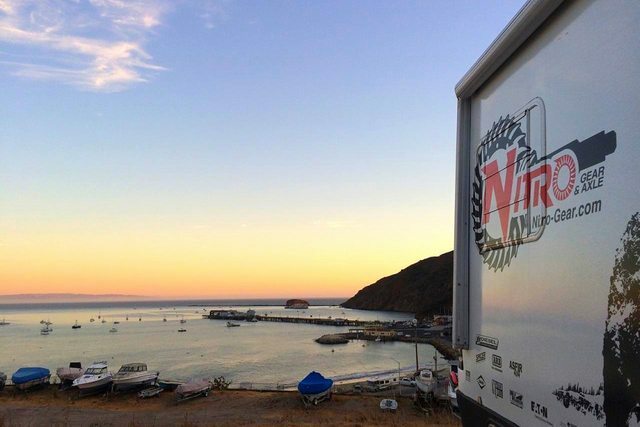 So no surprise when several years ago the idea of a go anywhere and tow whatever we want RV became a project here at Nitro. These are the complete specs along with photos of the build and current state of the project. Please let us know if you have questions. 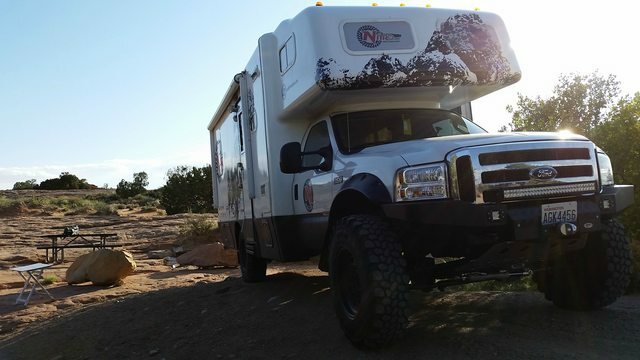 Started out as a 2004 Xplorer Xcursion RV / Motorhome 6.0L powerstroke F450 4wd chassis, leaf front Dana 60, Dana S110 Rear axle. -3x 20 gallon fuel tanks for a 600+ Mile range. -Best mpg over 500+ miles at 13.8 MPG, average 11-12, or 9-10 towing. Trans: ATS Stage 3 Transmission running a Billet convertor. Axles: Super Dana 60 front, Dana S110 rear. Nitro Gear 5.38 Ring & Pinions, Nitro Xtreme diff cover, Eaton E-locker front and Truetrac Rear, rear hubs swapped to 10 lug to match front.Warn manual locking front hubs. 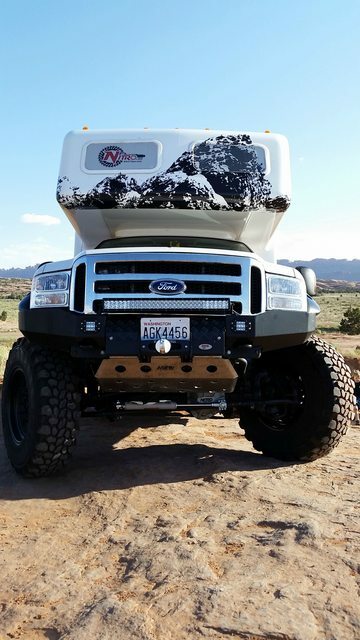 Body Mods-recovery: Bushwacker Cutout flares, ASFIR Modular bumper, Milemarker 15K winch, Masterpull synthetic line, Factor 55 Pro Link, 2007 Grille, headlight update (mirrors soon). Tires: Buckstop 20×11″ heavy duty single wheels with Goodyear G275 MSA 335/80r20 (41″) Miltary Tires. The Goodyear tires are a recent change from smaller Continental’s the rig ran for the past few years. So far the new tires have been a huge improvement in noise and road feel so we are very pleased with them. 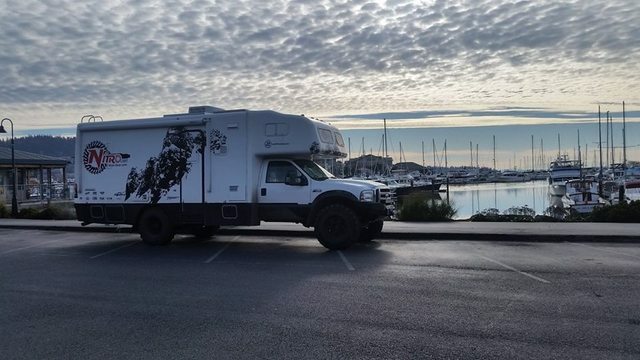 Our plan is to start documenting the trips and places the RV takes us now that it’s finally at a level where the bugs are worked out, performance is spectacular on the road and the onboard electrical systems are fully operation.